Indonesia is among the world’s most linguistically diverse nations. Consequently, inherent issues of language of instruction and of language in-education policies more generally have been unavoidable for policy-makers and of great significance to the people of Indonesia. Ideally, policies would balance several needs: continued development of a cohesive national identity; provision of high-quality education that is equitable and accessible; and, positioning the nation and its people for participation in the global knowledge economy. From the perspective of local languages, medium of instruction (MOI) policy in the school-level education system for the past seventy years has followed a monolingually-oriented path. Local languages, some of which continue to have tens of millions of users, have been slowly replaced by the national language, Bahasa Indonesia. Since 2013, local languages exist at the margins of the national school curriculum, without status or official use as MOI. English MOI has become the focus of controversy and legal intervention in the national school system, and the use of English MOI in school education is now ostensibly restricted to a thriving private school sector. However, government policy has encouraged the use of English MOI in internationally-oriented bilingual programs in higher education, and in 2015 a plan was announced to begin development of an Indonesian/English bilingual curriculum to be implemented across all universities in Indonesia (Dewi in English medium instruction in higher education in Asia-Pacific, pp. 241–258. Cham, Springer, 2017). In the current circumstances, enactment of this MOI policy means higher education is the site of attempts at transformation and innovation in bilingual education. 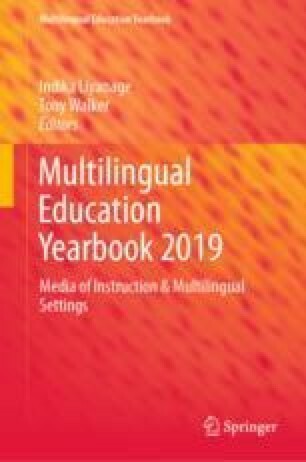 This chapter offers an overview of the current MOI policy situation and its background, identifies and discusses issues that have shaped the outcomes and prospects of bi/multilingual education under current MOI policy, and considers implications for bi/multilingual education in Indonesia going forward. Abduh, A. (2018). Adopting bilingual education in Indonesia. Retrieved from http://australiaindonesiacentre.org/adopting-bilingual-education-in-indonesia/. Benson, C. (2016). Addressing language of instruction issues in education: Recommendations for documenting progress (Paper commissioned for the Global Education Monitoring Report 2016, Education for people and planet: Creating sustainable futures for all). Retrieved from http://unesdoc.unesco.org/images/0024/002455/245575E.pdf. Bruhn, K. (2011). The internationalization of education in Indonesia: Comparative look at the RSBI Project in Daerah Istimewa Yogyakarta and West Sulawesi. In Proceedings of the IGSC III (pp. 145–155). Retrieved from http://igsci.pasca.ugm.ac.id/archive/v2.0/assets/files/igsc-03-033-katherine-bruhn.pdf. Clark, N. (2014, April 4). Education in Indonesia. World Education News & Reviews. Retrieved from https://wenr.wes.org/2014/04/education-in-indonesia. de Lotbinière, M. (2013, November 13). Indonesia to end teaching of English in primary schools. The Guardian. Retrieved from https://www.theguardian.com/education/2012/nov/13/elt-diary-november-indonesia-english. Fahmi, M., Maulana, A., & Yusuf, A. A. (2011). Acceleration or internationalization? A cost-effectiveness-analysis of improving school quality in Indonesia. Working paper in economics and development studies. Retrieved from http://repec.economicsofeducation.com/2014valencia/09-14.pdf. Fauzi, A. M. (2018, January 1). New initiative for Indonesian higher education toward world-class status. Retrieved from https://qswownews.com/new-initiative-indonesian-higher-education-toward-world-class-status/. Fillmore, N., & Handayani, W. (2018, March 28). Language matters: Language and learning in Bima, Indonesia. Retrieved from http://www.devpolicy.org/language-matters-language-and-learning-in-bima-indonesia-20180328/. Kompas. (2016, August 4). Jadikan Bahasa Daerah sebagai Pengantar (Make local language the language of instruction). Kompas. Retrieved from https://acdpindonesia.wordpress.com/2016/08/04/jadikan-bahasa-daerah-sebagai-pengantar/. Kosonen, K. (2017a). Language of instruction in Southeast Asia (Paper commissioned for the 2017/8 Global Education Monitoring Report, Accountability in education: Meeting our commitments). Retrieved from http://unesdoc.unesco.org/images/0025/002595/259576e.pdf. Media Indonesia. (2015, August 27). Bahasa pengantar picu putus sekolah di daerah (Language of instruction triggers school dropouts in regions) (p. 12). Retrieved from https://acdpindonesia.files.wordpress.com/2015/08/media-indonesia_p12_bahasa-pengantar-picu-putus-sekolah-di-daerah.jpg. Rinaldi, I., & Saroh, Y. (2017). The rise of National Plus School in Indonesia: Education for parents and government. Lingua Didaktika, 10(2), 194–205. Retrieved from http://ejournal.unp.ac.id/index.php/linguadidaktika/article/view/7322. Simons, G. F., & Fennig, C. D. (Eds.). (2018). Ethnologue: Languages of the World: Indonesia (21st ed.). Dallas, TX: SIL International. Online version: https://www.ethnologue.com/country/ID. Somba, N. D. (2017, April 26). Papua students learn local language. Jakarta Post. Retrieved from https://acdpindonesia.files.wordpress.com/2017/04/jakarta-post_papuan-students-learn-local-language.jpg. Suara Pembaruan. (2014, September 25). Anak yang diajarkan bahasa ibu lebih cepat paham konsep (Children taught in mother tongue understand concepts faster). Retrieved from http://sp.beritasatu.com/nasional/anak-yang-diajarkan-bahasa-ibu-lebih-cepat-paham-konsep/65512. Sukamdi, & Mujahid, G. (2015). UNFPA Indonesia Monograph Series: No. 3, Internal migration in Indonesia. Jakarta: United Nations Population Fund. Retrieved from http://indonesia.unfpa.org/en/publications/monograph-series-no-3-internal-migration-indonesia. The Jakarta Post. (2014, September 26). Pupils learn best in local languages, say experts. The Jakarta Post. Retrieved from https://www.thejakartapost.com/news/2014/09/26/pupils-learn-best-local-languages-say.html. The Jakarta Post. (2015, August 27). Bilingual education key to student success. Jakarta Post, p. 4. Retrieved from https://www.thejakartapost.com/news/2015/08/27/bilingual-education-key-student-success.html.